This has been one of those 'crawl into the cave and stay there' weeks. A final paper and exam for my Ethics & Jurisprudence class (along with a 10-15 minute presentation) has taken up a lot of thought time, so what do I do? It seems that whenever I'm up against the wall with projects and assignments, I mentally take off and do anything else. I've made (and sold) lots of jewelry this week...one of my co-workers asked me to bring in some earrings so she could look them over and perhaps do a little early Christmas shopping. 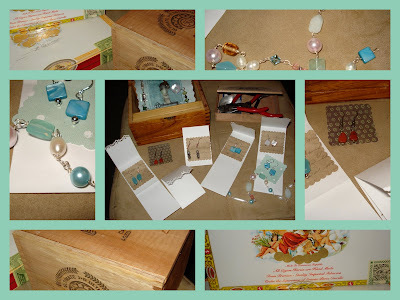 I keep my things in an old cigar box...it's a nice, compact way to carry things...anyway, I sold my earrings and took orders for a half dozen other 'custom' earrings and two necklaces. Nice. Another co-worker brought in a few cigar boxes for me from her "I don't know what I'm going to do with these" collection. I love cigar boxes...some of mine are among the few things the ex-husband left around that I wanted! All of the rain we wanted and needed over the summer is due to set in this evening and last for a few days...it's cool, dark, and gloomy here...a typical SW Indiana fall day. Think I'll just sit in front of the TV and make jewelry. Nice to have you back. Sounds cozy there in your world making jewelry. Very nice to sell some of your work, too! Way to go! That's so great that you're able to sell so much. My daughter is just getting into making jewelry which is good for me as I love earrings! Lovely pieces and nice presentation of your jewelry too. May I ask an unrelated question? What did you use to create this photo and the one in your header? I am still fairly new to blogging and interested in formats, backgrounds, widgets....all that good stuff. Sometimes I feel like crawling in a hole and pulling the covers over my head - usually on Friday after a "fun" week at work. At least you were splendidly productive of lovely things.